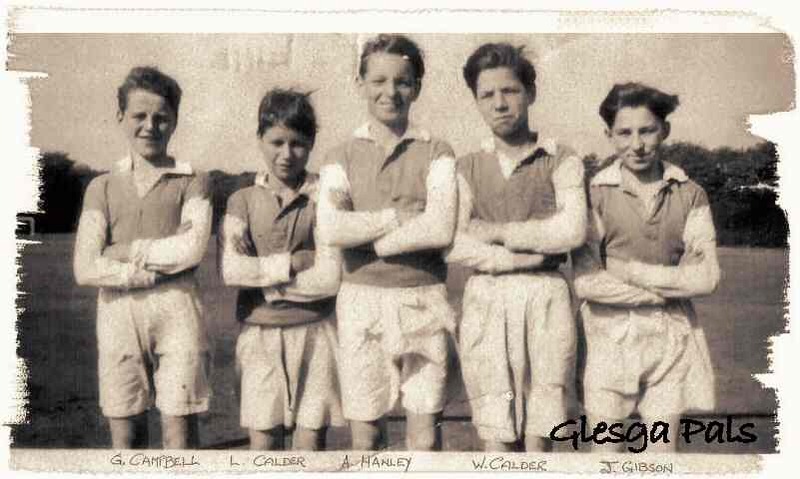 photograph sent by Alex Hanley of himself and 4 pals who were members of this Brigton street fitba team. where we played all our games. It was an eleven-a-side team and we played against other street teams. years. It would be interesting tae know who instigated the team? and who paid for the strips and what colour they were? (probably red though) and whit wiz the names of other teams Alex and his junior fitba team played? I'm definitly impressed, and as Alex quite rightly says, there must be mer pictures oot there, and even some of other schoolboy teams.........Excellent! used tae cut oot the shape of a trophy cup wae cardboard and cover it awer wae silver paper, and this would have pride of place oan tope of the middin wa awaiting the winning team tae carry it shooder high while dae'n a lap of honour for oor non existent fans. And whit I'd have gie'd for a fitba jumper and a perra fitba boots as this definitly would have enhanced my overall ba control and dribbling skills. Brings back great memories. We had a street team when I lived in Provanmill. We simply called ourselves "The Crescent" because we lived in Greenside Cres at the time. Oor arch rivals were "The Street", (Greenside Street, you might have guessed!) I remember some full-blooded encounters, and a few punch-ups........ We wance played against a team from Dennistoun in Alexandra park and we invited them up tae Provanmill for a "return" match which ended in a mass brawl when a gang fae Blackhill disrupted the proceedings. We played most of our matches on the red ash pitch behind St. Philomena's school against the other "organised" street teams. Money was always tight, so I decided to raise funds by selling boxes in "football cards". There were 80 squares on each card, at 3d a go. The winning team name was taped to the top of the card. I well remember the excitement of peeling off the tape to see who had won! When the great day arrived we all headed down to the Saltmarket to buy the cheapest rig-oots we could find. We ended up with yellow tops, white shorts and socks, and a big white number on the back. Hardly ideal, but not a logo in sight, and at least we all looked the same! Sadly, I don't think any pictures were ever taken of that rag, tag and bobtail outfit. All we did was play fitba'. Nae computers, mobile phones ur other distractions in them days!